Please welcome guest author Jennifer Fischer. Jen is a freelance writer and home decorator who loves sharing DIY tips on decorating a home on a budget. Today Jen will be sharing tips for holding a successful yard sale – something I’ve never been able to do. Take it away Jen! Yard sales are a win-win-win for everyone. You get the opportunity to get rid of clutter throughout your home and make money. People attending your sale can find some treasures and all the leftovers get donated. If your yard sale is successful, you will finally be rid of all those unwanted items in your home in one day— key word being successful. 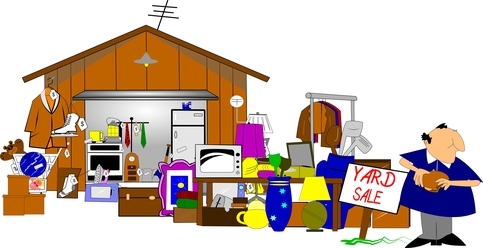 Planning, preparation and a great marketing strategy will help you throw the best yard sale. Throughout the year when you come across something you or your family no longer needs, keep it in the “yard sale stash.” You can store this stash under the stairs, in a designated area in your garage or in a storage unit if you have one. If you don’t have one, you can find storage unit information all over the web, and most likely there’s a local storage unit facility around your neighborhood. You will find that by the time you have your garage sale, you will have boxes and boxes of items to sell. First, you need to figure out the best date when attendance will be as high as possible. Saturday mornings are usually prime sale days, especially when weather is sunny and cool. The best months to hold garage sales depend on your regional climate, but generally the best months are April, May, June and September, according to SideRoad.com, an expert tip site. At least a week before your sale, start organizing. Go throughout your home and clear out any last-minute clutter. A few days before the sale, start tagging and pricing all your items. Organize the items by category, that way when the day comes you will be able to bring it out quickly and efficiently. Create fliers and post them around the neighborhood or on community bulletin boards. Post an event on your Facebook and let all your friends and family members know about your upcoming sale. Post an ad to Craigslist listing the date, time and location of your sale. If it’s budget-friendly, post an announcement in your local newspaper. The No. 1 mistake sellers make is pricing their items too high or not having reasonable expectations. Remember your main goal is to declutter and minimize your belongings. And although it’s tempting to place a large sign on a table saying everything is a quarter, most people won’t look at that and ask you anyway how much the item is. It is much more efficient to put a price sticker on every item, which makes it clear to the buyer. Some people are too shy or don’t want to waste time to ask how much an item is, potentially costing you a sale. The Haggler’s Strategy – If you enjoy negotiating, this strategy works well. Keep a list of items and your desired price range and wait for hagglers. For those bargaining customers who want to make an offer, you’re able to counteroffer and haggle based on the predetermined price range you had set for the item. The Tag Sale Strategy – This if for those firm sellers. No negotiations will be accepted and the sell price will be whatever is reflected on the sale tags and stickers. This sale is more appropriate for items with a higher dollar value. If you find you have some pieces you’re unsure of the price but think they might be worth money, check eBay, Amazon and Craigslist for similar items. That way you have a feel for the price and a great range to price the item at. If customers try to haggle the price, let them know you priced the item based on research. Thanks for those great tips, Jen! I tend to fall victim to the #1 mistake and price my items too high. Next time I hold a yard sale you can be sure I’ll do my research so everything is priced to sell. What are your best yard sale tips and tricks?